The next generation of thorough and deep cleansing! This tool is truly deluxe. I am loving my skin with it's use. Not only does it exfoliate the surface - leaving soft and really clean skin, but the vibrations seem to help at a deeper level - like getting a massage - it works on tone. It's easy to use and add to your daily routine and like I said, I'm loving it. I have even been using the brush with my regular cleanser that I use. 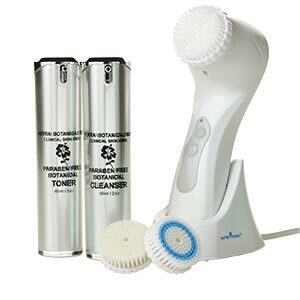 One super lucky winner will recieve Nutraluxe MD ~ Nutra Sonic Face Brush System!!! *Follow me @jamaise at Twitter & Tweet this : RT @jamaise #GIVEAWAY #WIN - a Nutraluxe MD ~ Nutra Sonic Face Brush System Professional http://bit.ly/bEG3Gc Ends 8/15 tweet each day for one entry each ! Disclaimer: Nutraluxe MD provided me with a free sample of this product to review, and I was under no obligation to review it if I so chose. Nor was I under any obligation to write a positive review or sponsor a product giveaway in return for the free product. These views are my own. I follow your blog and I'd like to try the Eye Lifting Serum. Thanks. I would love to try the Night Recovery Complex. I would like to try Skin Polish Set. 1. I follow your blog with GFC. 2. I follow your blog with GFC. 3. I follow your blog with GFC. 1. I entered Hello Mellow Body Butter. 2. I entered Hello Mellow Body Butter. 3. I entered Hello Mellow Body Butter. I would like to try the Nutra Light Blue Phototherapy. I like Naturaluxe MD on db. I follow Naturaluxe MD on twitter. I would love to try the Hair Active stimulator. I am a fan of Nutraluxe MD on Facebook. I shared the contest with over 400 friends on Facebook. I do not have twitter anymore. They perm disabled my account. i am a new google friend! I would love to try the luscious lips lip plumper.